Limited access to specialist care remains a major barrier to health care in Canada. The consultation-referral process is complex and involves many factors that can limit the effectiveness and efficiency of patient care. Patients, Primary Care Providers and specialists express high levels of frustration about poor access and too-long wait lists. Patients often wait months to see specialists, facing frustration and sometimes worsening conditions, only to learn for example that all they needed was a medication change. The risks of delays only increase as a person ages and as they become frailer. What barriers do LTC home residents face to access specialist care? Long-term care residents face multiple barriers to accessing care, as a growing number of residents suffers from Alzheimer’s disease or other dementias, complex health issues, multimorbidity, and physical frailty. These conditions increase the need for specialist care and at the same time reduce the residents’ ability to easily go to see specialists. A recent report from the Canadian Institute for Health Information noted that 25% of elderly Canadian patients waited over 2 months for specialist care, and 37% went to hospital emergency departments for treatments their PCP could have provided. These figures place Canada last among the 11 countries surveyed. 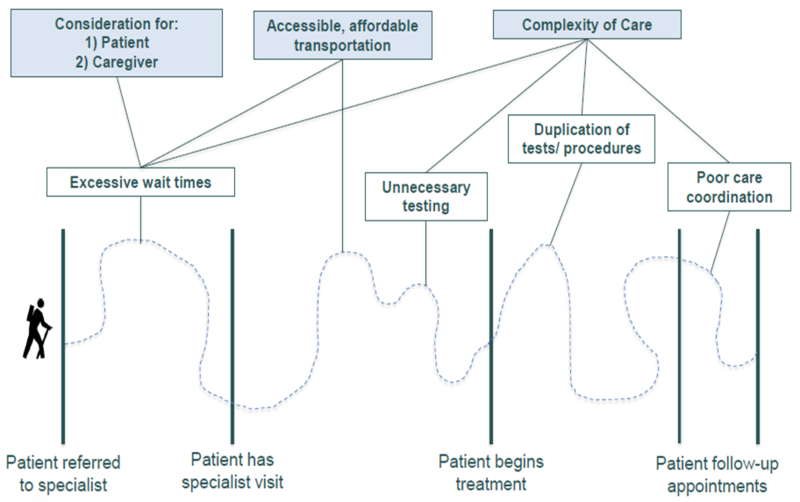 Given that wait times are affected by multiple factors, Ontario needs an integrated solution. This is where the Champlain BASE™ eConsult Service comes into play. 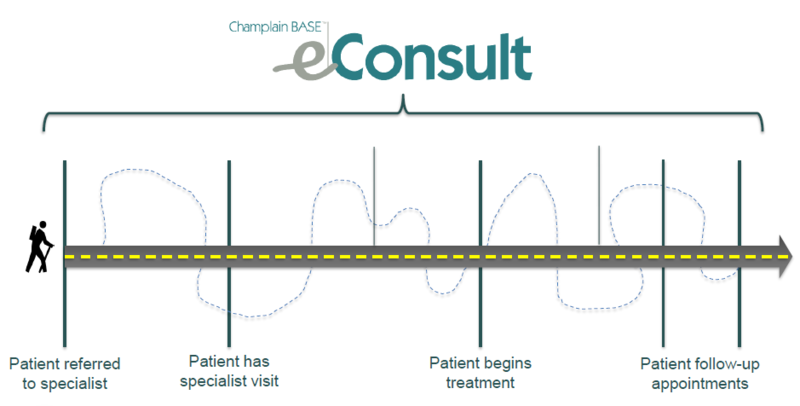 Champlain BASE™ eConsult is a secure, online platform connecting primary care providers (PCP) to specialists. The PCPs are able to consult with specialists on any questions they may have about their patient and receive a response from the specialist in a timely manner, never longer than seven days. With over 100 specialties available, the PCP can submit their patient-specific questions along with any supporting documents or photographs. Experience shows that this connection often eliminates the need for the patient to visit the specialist at all, as now the PCP can provide the care that their patient needs. This service is highly successful in the Champlain region across the primary care community. In collaboration with the Ontario Centre for Learning, Research and Innovation in Long-Term Care (CLRI) at Bruyère, the Champlain BASE™ eConsult service is now implementing the service in 2-4 long-term care homes in the Ottawa and surrounding area. “I know eConsult works. Down the road maybe they will get it [to help] caregivers of [residents with] long running diseases like Alzheimers, M.S. and Parkinson’s whose caregivers [and…] for whom it is hard to move their loved ones [particularly] in the later stages.“ – Family member who attended the National eConsult Forum in Ottawa on December 11, 2017. Most recently, eConsult’s primary care lead Dr. Clare Liddy was featured in a webinar series hosted by the Ontario CLRI. On February 6, 2018, Dr. Liddy discussed the implementation of the Champlain BASE™ eConsult service in Ontario’s long-term care homes. The goal is to improve integration of care, patient safety, and quality of life for complex aging residents. Opening with an informative and engaging overview, Dr. Liddy explained the need for specialist access in LTC, the benefits of eConsult, the current project, and how homes can get involved. Watch a recording of the webinar to learn more about the Champlain BASE™ eConsult Service and how it is being implemented in long-term care in Ontario. A shorter version of this article first appeared in AdvantAge Ontario‘s Action Update, a monthly newsletter for AdvantAge Ontario members.